The mission of the Office of Student Diversity and Inclusion’s Next Generation Mentorship Program (NGMP) is to provide undergraduate students of color, international students, and students from other underrepresented populations opportunities to become successful in their undergraduate academic career and beyond. Through the guidance of graduate student mentors during the entire academic year, undergraduate student mentees will be provided the services, resources, encouragement, and support needed for their future goals and aspirations. This mentorship program aims to deepen the Office of Student Diversity and Inclusion’s commitment to students who come from underserved and underrepresented communities. Our goal is for mentees to deepen their undergraduate experience, gain insight into the mentor’s graduate experience, explore career paths, post-graduation options, and be supported in their academic and student success. For the graduate student mentors, this is an opportunity to give back, to support the next generation, and also to gain leadership, coaching, and mentorship experience that will enrich their graduate school experience while also benefiting their career and trajectory. Are you an undergraduate student interested in becoming an NGMP mentee? Apply here! 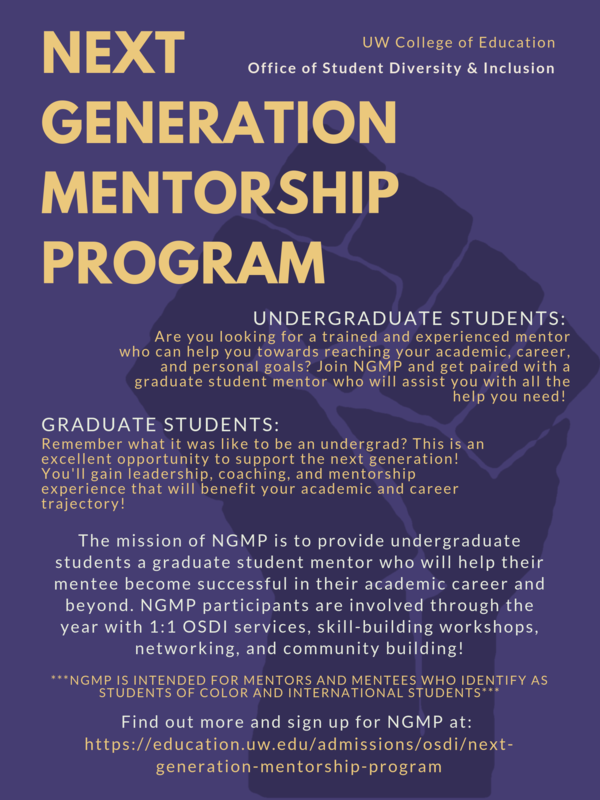 Are you a graduate student interested in becoming an NGMP mentor? Apply here! Week 5 TBD NGMP Quarterly Social: Professional Development Workshop Workshop for undergraduate mentees seeking help on resumes, CVs, work authorization options, mock interviews, etc. A May 2 public event will highlight the work of teacher education programs that are partnering with tribal communities to center Native teachers, students, families and communities.